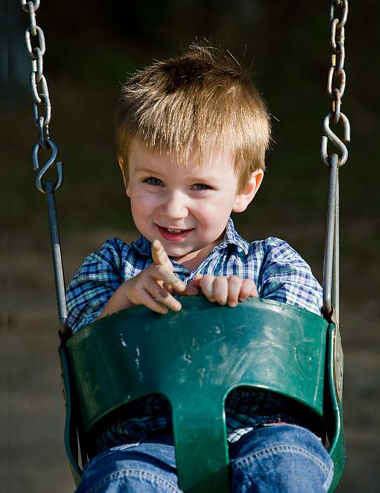 Reinforce positive behavior by telling your child what he’s doing right. 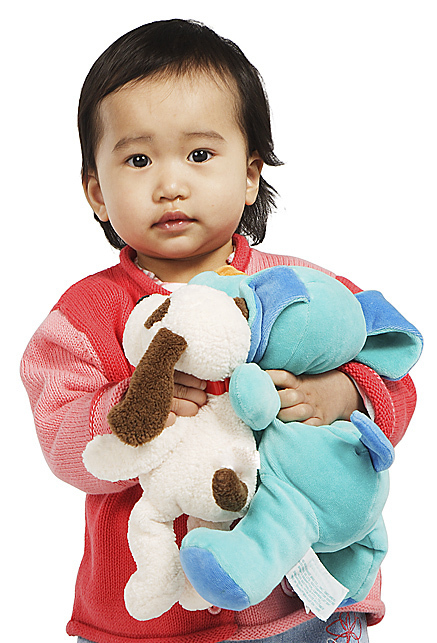 Your child may have a special toy or security blanket. Use milk cartons as blocks to teach shapes and sizes. Clean your toddler’s teeth and gums and give water with fluoride. Take time for yourself: Spend time with a friend or plan your future. Your child develops at her own pace. Children may have temper tantrums. 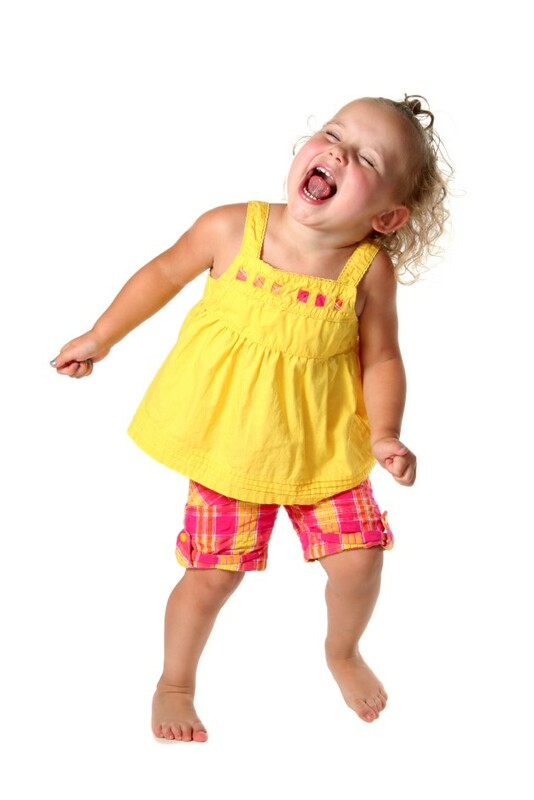 Your toddler learns rhythm by dancing with you. Reduce sodium to prevent high blood pressure. What’s it like to be 19 – 20 months old? Toddlers obey people they trust. 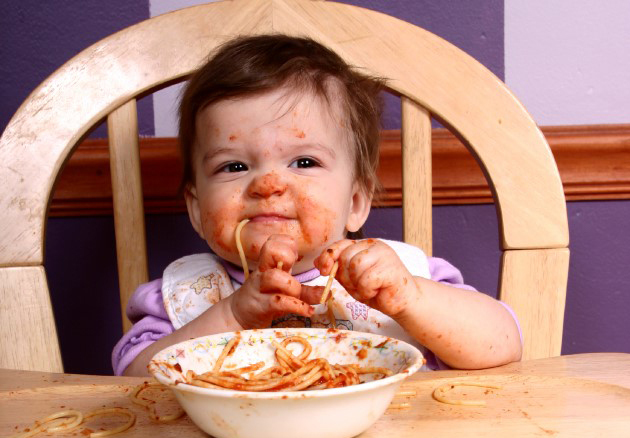 Toddlers can be messy at mealtime. Hot liquids and appliances can burn your toddler. Does it seem that your child changes almost too fast — while at other times he learns things sooo-o slowly? Your little one wants to learn and is doing his best. Some things are just hard for him to get the hang of. You can help by being calm and by paying attention when he is doing something right. That way, he won’t get upset and have trouble learning. I can brush my own teeth. Sometimes I will let you know when I’m going to have a bowel movement. I can let you know when I need dry clothes. I may be able to kick a large ball. I like being independent, but sometimes I want to act like a baby. I can run without falling too often. I still like to climb on things. I don’t know about safety, so I count on you to keep things safe for me. I can say about 15 words, and I’m learning new words all the time! I like to listen to nursery rhymes. I ask a lot of questions —mostly by saying “whatdat?” or “what’s that?” Be patient with me. I am just trying to learn. I can pull the toilet paper wa-aa-ay out. I can put two pieces together to form a simple puzzle. I’m beginning to know what things are for —like a hammer is for banging. I can draw an up and down line pretty well. I like to play alone, but I like adults to be near me. I enjoy swinging on a swing. I like dressing up in adult’s clothes and pretending I am an adult. I like picture books, and I love looking at pictures of myself. I like you to sing to me. I like making mud pies and pretending to eat them. I like to take toys apart. I like rides and walks. I like to look at myself in the mirror. I like to help you do simple things. I’m still not very interested in other children. Even when I’m with other children, I like to play alone. I want to keep my toys to myself, and I may hide them so others can’t play with them. I need time to get to know people. I’m afraid of some people. I like to do things without adult help. I may be friendlier with other children than adults. Sometimes children between the ages of 1 and 3 have temper tantrums. They may cry, shout, hit, bite, throw themselves on the floor, and kick. Some hold their breath. You may not know what started the tantrum. You certainly know you want to stop it! Some children have tantrums, because they have learned it is a way to get something they want. Others copy parents who have quick tempers. Tantrums might mean that the child is angry or upset. Maybe she has been told too often what she cannot do. Children seem to have temper tantrums most often when they are too tired, frustrated, hungry, or very excited. Temper tantrums are normal for children this age. Try to stay calm —which is often hard to do. Keep your child from hurting herself or others. Remove her from other children or from the place where she’s having her tantrum or just hold her in your arms. When your child has calmed down, hold her and try to learn the reason for the tantrum. If you give the child what she wants when she has a tantrum, she might learn to use tantrums to get her own way all the time. Blocks allow young children to learn about patterns, shapes, and sizes. They learn how to stack things, and what happens when stacks are knocked down. These lightweight building blocks —which cost almost nothing to make —are very popular with children. Take any two cartons of equal size and cut them to the same height. Turn one over and slip it inside the other so that it makes a block. Tape the edges with duct tape or heavy mailing tape —any kind of tape that children can’t peel off and swallow. You can cover the blocks with contact paper or you can paste letters, numbers, or pictures on them. Lay the blocks on the floor and watch what your child does with them. Build them on top of one another and see what your child does. There is no right or wrong way to play. Use blocks to teach big and little. Place three big and three little blocks on the floor. Pile the blocks up in different patterns and describe what you are doing. “Now I’ll take the big block. Now I’ll put the little block on it,” and so on. Now say something like, “We need a big block. Give me a big block.” Or ask for the little blocks, so that your child learns the difference between big and little. Help your child make up other block games or big and little games you can play together. Toddlers are messy eaters. You can bet that a lot of food will end up on the floor. If you are worried about the carpet or floor, put an old sheet or tablecloth under the high chair. You can shake it out after meals. When it gets really dirty, you can wash it. Spoon with a short handle. Bowl with sides to push food up against. Cup that your toddler can circle his hands around and pick up. This cup shouldn’t tip over easily. If you use a training cup with a lid, it can make drinking easier. There will be lots of spills. Most of the time spills will be accidents. If it happens three or four times in a row, your toddler might be playing or trying to get your attention. This means it is probably time to end the meal. Serve your toddler food at the same time everyone else is eating. Your toddler will learn how to eat by watching you and other family members eat. Don’t expect good table manners yet. Your child will learn these over the next few years. A high chair can help. Toddlers are such busy little people they might not want to stop to eat when it’s time for a meal or snack. When you put your child in a high chair, he knows that it’s time to stop what he is doing and eat. 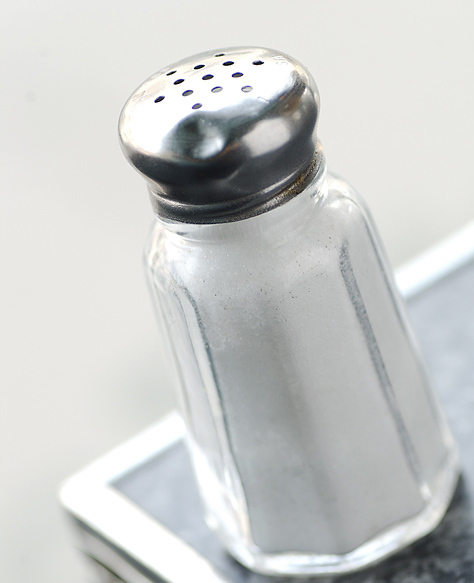 Too much salt can lead to high blood pressure and other health problems such as heart disease and strokes. Do you know it’s important to watch your child’s salt intake? Even at 19 and 20 months old, many children are eating too much salt. Young children who eat more salt develop a preference for salty foods, and may have a harder time breaking the salt habit later. Children are being diagnosed with high blood pressure at younger and younger ages. Healthy eating habits built now will last a lifetime! Do it a little at a time. You don’t have to switch from high-salt to salt-free all at once. Cut down on the salt you add to foods. Don’t salt the water when you cook pasta or hot cereal. Add half the amount of salt called for in recipes. Eat out less often. You have more control over the amount of salt and sugar and fat in your food if you prepare it at home. Instead of stopping for fast food, choose something that can be made quickly at home (like sandwiches). Toddlers like plain food. Most toddlers don’t like intense flavors, including salt —unless they have tasted them regularly. Your child may be happy with a plain meal —like baked chicken with potatoes and steamed carrots —without any added spices or salt. Read labels. Food packages list the amount of salt or sodium in the food. The next time you are shopping for food, check the sodium. Look for low-sodium or sodium-free soups or vegetables. Buy fresh or unsalted frozen vegetables. Canned vegetables contain a lot of salt. Read frozen food packages to be sure they do not have added salt. Rinse canned foods. Rinse canned beans or vegetables under clear water for one minute, and then cook them in fresh water. Rinsing will lower the amount of sodium in the food. Set a good example. Taste your food before salting it. Cut down on the amount of salt you add to food at the table —or even take the salt shaker off the table. Remember that your child will learn about salt by watching you. You may feel like you never have a moment for yourself. If you’re feeling stressed out, find some time just for you. Trade babysitting with another parent, or trade a service like cooking a meal in return for a few hours of baby-sitting. Take a bubble bath, a walk, or a swim, see a movie, or read a book. Plan your future. Look for classes you might take, jobs you might like, things you would enjoy. Spend time with a friend — without children. The time you take just for yourself will help you feel better — and ready to face parenting again. Perfectly normal children differ in the ways they develop. Some children walk as early as 7 months. Many do not walk before they are 18 months old. Children may begin talking at 8 months or at 24 months. Your child enjoys learning new skills. You can support this learning —not by pushing or putting down or comparing your child with other children —but by teaching, encouraging, and celebrating her successes. Lots of children have special blankets, teddy bears, or toys. Some children take up with the strangest things. They claim them and call them their own forever —or at least until someone makes fun of them. The most common favorite object is a blanket. Your little one may appear every morning with one thumb in her mouth and the other hand holding a ratty, worn blanket. Heaven forbid if the security blanket should get lost, stolen (who’d want it? ), or washed. Yet that blanket or teddy bear or toy is a friend who has shared your child’s life —through thick and thin —in sickness and health, in good times and bad. Most of us would welcome such a friend if it could do as much for us. Some parents are close and loving with their children; others are tense. In a close family, the child feels secure. She feels she can count on her parents for love, care and safety. When parents see their child’s distress and can comfort the child, they become close and secure. Children are more likely to obey parents if they have a positive, trusting relationship. Toddlers like to do things with their parents —like moving to music and dancing. Turn on some music. Teach your child to do a happy dance. Dance to fast music and to slow music. Hold hands and dance together. Clap your hands to music or use large wooden spoons or beat on something that makes a nice noise. Show your little one how to keep the rhythm and play along with the beat. Children grow up to like the music they hear when they are little. Play different kinds of music, and your child will probably learn to enjoy many kinds of music. Helping your child chew and talk. Saving space for adult teeth to grow in straight. Helping your child feel good about her smile. Gently clean your baby’s teeth and gums daily with a damp cloth, gauze, or toothbrush. Feed only formula, milk or water from a bottle. Do not add sugar. Offer the bottle only at feeding time. If you use a pacifier to comfort your baby, never dip it in any sweet substance. Your child needs fluoride to build strong teeth. Check with your county health department to see if fluoride is in the water. If it is, then be sure your child gets enough water to drink. If your drinking water does not have fluoride, ask your doctor about fluoride supplements. Take your child for a dental checkup when she is between 2 and 3 years old. 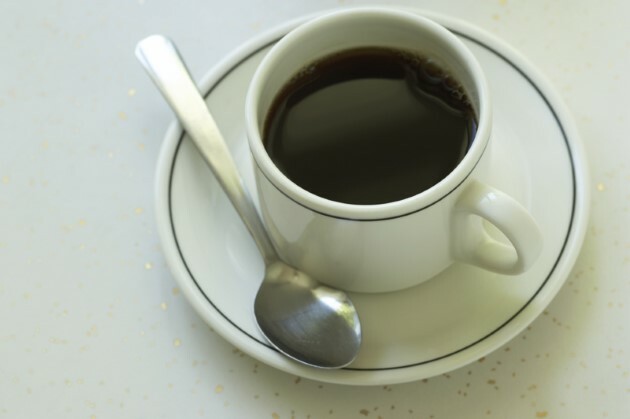 Hot liquids and foods —such as coffee, tea, and grease. Touching hot surfaces —such as stoves, irons, and heaters. These burns occur most often in the kitchen when hot liquids are spilled. Be careful when you are cooking and serving. Hot appliances can burn children. In this early age, children grow so fast parents are often not ready for what a baby can do. Toddlers can pull hot food off a table or touch a hot stove, while they are trying to walk. Never eat, drink, or carry anything hot when you are carrying your child; you can’t handle both! Never leave anything hot on the edge of a table or counter. Be very careful when your child is with you in the kitchen. Don’t let him play in the kitchen when you are not there.